When I was about 4, the first aeroplane whose name I learned from my father was the de Havilland Tiger Moth. 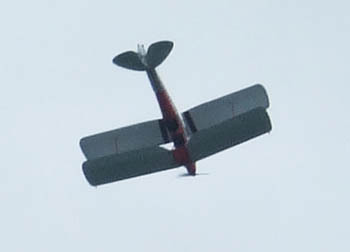 I used to watch the little silver biplanes doing lazy aerobatics above me over the Surrey hills on which we lived. Yesterday I actually had the opportunity to fly in a vintage 1943 Moth, thanks to a belated birthday present. 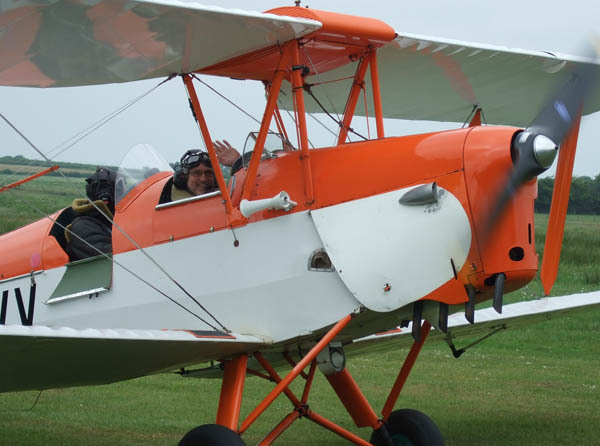 I have to say the Tiger Moth is what flying is all about, if you don’t happen to be an eagle. Or a moth, I suppose. Being in an open cockpit with the wind whistling through the wires and past ones ears has a lot more to do with the flying of ones dreams than the nightmare of commercial flights has. It even seemed less turbulent, somehow – even when taking off and landing on a grass airstrip. The foolish pilot allowed me to take the controls for a bit, and I managed to steer on to a new course without stalling the thing. I didn’t have the faintest idea where we were, though. That was only the start of a very full day – in the evening my band played at a Royal Jubilee Ball (a long way from anyone royal, unfortunately), so I didn’t get much sleep. And this morning in church someone collapsed with a possible cardiac condition, so I had to pretend to be a doctor again. Perhaps it’s going to be an interesting week.